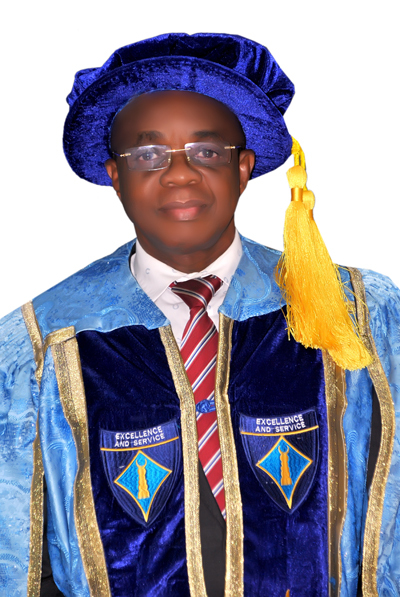 ELEAZAR UCHENNA IKONNE, a Professor of Optometry since 2006, is the 7th substantive Vice-Chancellor of Abia State University, Uturu. He assumed this ofﬁce on 1“ December, 2015. O.D (Doctor of Optometry) degree from Manila Central University, Philippines, on scholarship by the Greater Imo State Government. He has over ﬁfty (50) scientiﬁc articles in peer- review national and international journals, two (2) reference Books on Clinical Application of Diagnostic procedure in Optometry. External Examiner to University of Benin, lmo State University, Federal University of Technology Owerri, Madona University Okija, University of Cape Coast Ghana etc. Member, National Universities Commission (NUC) accreditation team to various universities. Chairman, National Universities Commission (NUC) accreditation team to various universities. Member, National Research Fund-screaming Committee, TETFund. Registrar, Nigerian Post-graduate College of Optometrists. Vice-Chairman Optometrists and Dispensing Opticians Registration Board of Nigeria. He has numerous Awards of Excellence and recognition from notable Civil Societies, Churches, professional bodies and the Media houses. Okaa Omee I of Abia State University by Students’ Traditional Council. Ikemba I of Agburuezeukwu autonomous Community in Abia State. Ugonmuta of Abia State, by Abia State Council of Traditional Rulers. The 8th child out of the 9 (nine) children of a Catechist in Anglican Communion, late Mr. & Mrs. William Ikonne, Professor E. Uche Ikonne has for the past twenty years, till date served the congregations as a Bible Study teacher, Lay Preacher and Pastor’s Warden at the Church oi‘ Good Shepherd, Ehimiri, Umuahia. Okezie Uche-Ikonne, a PhD Medical Statistics student, University of Lancaster, United Kingdom.